Här har vi en Stereo Hi-Fi Balun som gör det möjligt att skicka analogt ljud upp till 1 km över en enkel Cat 5e UTP kabel. Denna balunen används i par men säljs separat. 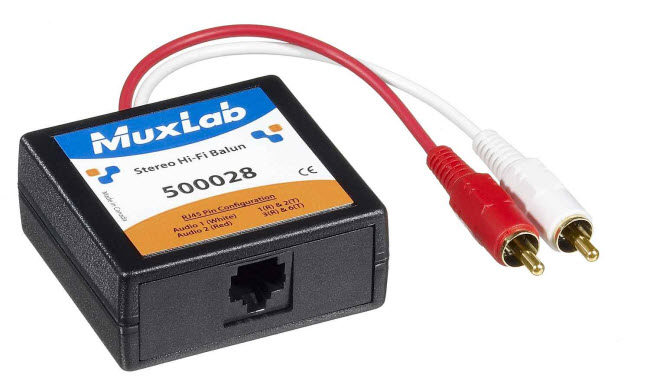 The Stereo Hi-Fi Balun allows unbalanced line level stereo analogue audio to be transmitted via Category 5 unshielded copper twisted pair (UTP) in a point-to-point connection. The product is designed for audio applications where full-range, hi-fidelity audio frequency response is required. Used in pairs, the Stereo Hi-Fi Balun eliminates costly and bulky coaxial cable, allowing audio equipment to be connected or moved within a structured cabling environment.